You’ve worked hard to achieve your goals. Now, it is time to celebrate! We’ve created this website in honor of our 2017/2018 academic year graduates. If you completed an iSchool program during summer 2017, fall 2017, spring 2018, or will be finishing up in summer 2018, please take a moment to fill out your graduate profile. It’s a fun way to share a little bit about your iSchool experience and future career plans. You can also post messages on your peers’ profiles. Think of it as a yearbook where you can share your sentiments with each other. This is a momentous occasion that we should all celebrate! Instructors, co-workers, family members, and friends are encouraged to join in the fun and post congratulatory messages to our graduates. Let them know how proud you are of them and share your excitement for their next journey. The synchronous online celebration occurred at 11 a.m. Pacific Time on Saturday, May 19, 2018, where iSchool Director Sandra Hirsh and our guest speakers shared words of wisdom to mark this great achievement. You may watch the recording of the ceremony at your convenience. 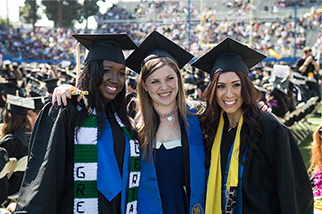 Don’t forget to use #SJSUiSchool2018 for all your social media shares. And if you are looking for memorabilia, check out our store on Zazzle. Please watch the celebration video created by our students for the Class of 2018.